Natural marble is an exquisite addition to any property, but it can carry a high price tag. When clients are looking for budget-friendly options, it’s wise to have some more cost-effective inventory items available to please clients who are working on a tighter budget. Ironically, some of the more affordable choices are also more eco-friendly. Engineered marble is moving to the forefront as a recycled material that’s durable, green and affordable. When you’re developing a materials list for potential customers, you should include this in your options. Natural stones are porous, so they have to be sealed to keep water out of them. This is one area where engineered stones actually outperform what Mother Nature created. Through the process of creating the natural marble look from scratch, smaller recycled stones are crushed and then pressed and bonded using a small amount of resin. The result is a material that’s less porous than natural stone and more resistant to moisture. This makes engineered stones a top choice for bathrooms, showers and other areas that are going to see a fair amount of moisture and water. The stones are also more resistant to mildew and staining as a result, so they’re easier to clean. When the marble quarries pull stones from the Earth and manufacture them, a good deal of stone is wasted in order to make smooth tiles in exact dimensions. Engineered marble takes those scraps and puts them to good use by creating new tiles and slabs that can be used throughout homes and businesses. Marble that is taken out of homes as part of renovation projects can also be recycled and transformed into beautiful, engineered tiles. What once was wasted becomes a beautiful addition that people can feel great about. When you have clients who are asking about green options and focusing on environmentally friendly building methods, you’ll impress them by offering a smart alternative to natural stone tiles and slabs. Some people look at marble and embrace the natural veining and unique beauty. Others, however, want more consistent color to match a specific decor. In the past, the only solution was to move away from natural stones and go with ceramic tile, which is not as strong or luxurious as marble. However, engineered options combine the best of both worlds. The use of waste materials and careful construction methods allows manufacturers to create tiles that look and feel like marble but have greater color consistency. When a customer wants a specific color with minimal variation, engineered stones are the best choice. The stones are as strong and elegant as marble, but they also feature wonderful color consistency that will please clients who’ve always chosen ceramic in the past. As a contractor, you want to work with materials that are more durable. They’re more appealing to customers because they last longer, and they’re more attractive to contractors who want to avoid having pieces damaged while in shipment or storage. 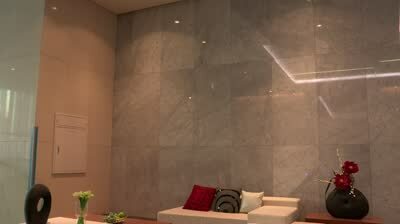 Engineered marble meets this demand in a stylish and attractive format. The use of pressure and special resins makes engineered marble stronger than its natural counterparts. It’s ideal for use in high-traffic areas and it can even be installed in commercial settings. It’s less likely to crack or break between the manufacturer and final installation point, helping contractors reduce breakage and minimize losses. Another benefit of engineered marble is that it’s easier to maintain and clean. Real marble can stain, and it must be sealed annually to protect it. The cultured option, however, is easier to maintain because it’s less porous. They’re easily cleaned with a damp sponge, and you can use some soapy water if you need to do a deeper cleaning. People often worry that their natural marble will stain, but this is less of a concern when you have an engineered option that’s naturally strong and resistant to stains. Your clients can buy special cleaners for their cultured marble, but they don’t have to. They’ll appreciate your foresight in providing them with a product that’s so easy and affordable to care for. It’s normal for customers to worry about scratching their marble floors. However, they can rest easy knowing that their engineered alternative is more resistant to scratching. When you install marble or natural stone of any kind in a client’s home, you should also provide them with information on preventing scratches. This includes using pads under furniture, sweeping often and keeping mats near doorways. However, they’ll love having a product that’s also more resistant to scratching. Any scratches that do occur can typically be sanded out using a very fine sandpaper. Your customers will be impressed with your foresight in using products that are naturally more durable, and they’ll love knowing that their engineered floors will last for decades. Cultured marble also has a more attractive price point. Anytime a customer is worried about their budget, this is an excellent option. It looks as beautiful as natural marble, but they’re less expensive because they’re partially man-made. Offering budget-friendly options to your customers will help you earn their trust as a contractor who’s looking out for their best interests. Offering luxurious, high-end materials alongside more cost-effective materials helps you cater to a wider range of customers and increase your client base. It’s also important to consider the weight associated with natural versus cultured marble. Natural stones are very dense and extremely heavy. While this is desirable in some applications, it can become problematic with the transportation and installation of the products. It costs more to transport, you need more people to handle moving it into position, and it can prove too heavy for some areas. Cultured marble allows you to avoid these challenges because it’s lighter in weight. Transporting it is easier, and you won’t have to bring in an additional crew to get it in place at a client’s work site. The lighter weight makes it a better choice for wall claddings and in some other applications. There are several benefits associated with engineered marble. While you’re going to have customers who want the real stones and won’t accept substitutes, solid marble tile won’t appeal to everyone on your client list. You’ll also have people who have avoided natural marble because of its color variation, porous nature or cost. Engineered stones overcome all of these problems, so they appeal to an incredible range of home and business owners. Your clients will be impressed with the eco-friendly option, and they’ll love how easy it is to care for. If you are interested in enhancing your business or home with our beautiful natural stone, contact us today through our online form. You may also call us at (305) 501-4548 to speak to one of our professionals from the most affordable engineered stone wholesaler in Florida!